This is one of the funniest (saddest?) stories I've read in a while. It's funny because it's a story, in the form of a bug report. I'll let the following quote explain it. "This privacy flaw has caused my fianc� and I to break-up after having dated for 5 years. Basically, we share one computer but under separate Windows XP user accounts. We both use Mozilla Firefox -- well, he used to use it more than I do but now we don't really use it. The privacy flaw is this: when he went to log-in under his dating sites (jdate.com, swinglifestyle.com, adultfriendfinder.com, etc. ), Mozilla promptly asks whether or not he'd like Firefox to save the passwords for him. He chose never, obviously. However, when he logged off his user account, and I logged onto my Windows XP account X amount of days later, I decided to use Firefox because hey -- it loaded everything much more efficiently, was better to work on with website designs and is a lot more stable than IE7beta2." Internet | Engadget caught for stealing? "As you can see, the original post on Engadget (as it appeared briefly on the front page) included a link to DAPreview and the picture from DAPreview, including a blue version of our logo. We had no problem with this. In fact, we appreciate the support, since it sends traffic our way and brings new people to DAPreview. However, on the revised version of the same story, the link to DAPreview was removed and it has a chopped version of our picture with the DAPreview logo cut out. We do have a problem with this. They have deliberately circumvented a credit to DAPreview. Instead, the story now links to another blog (mobilemag) that covered our story. This is equivalent to ripping us off." And it seems it isn't just Dapreview getting the shaft, Ohgizmo has a story to tell too. Software | Windows XP on Mac success! "Contest has been won - updates to follow shortly. All further donations will go into an account to sustain the open source project that will be launched with the initial solution." Their site is getting hammered, so here's a local link to download the instructions on how to do it. Technology | It's the robocarp! Some light reading for this morning. Mushkin 2GB XP2-5300 3-3-3 @ techPowerUp! Over the past few weeks, many banks have been re-issuing debit cards due to fraud. There wasn't any word as to how this happen, but customers were seeing random charges appear out of no where. That's about to stop real soon since 14 suspects have been arrested. "Law enforcement officials in New Jersey have arrested 14 people in connection with a crime spree that has forced banks across the nation to replace hundreds of thousands of debit cards. The suspects, all U.S. citizens, are accused of using stolen credit and debit card information to produce counterfeit cards that were used to make fraudulent purchases and withdrawals from card-holder accounts, Hudson County Prosecutor Edward DeFazio said. Most of the arrests were made during the past two weeks. Some of the stolen credit card information came from the office-supply chain OfficeMax and other businesses, DeFazio told CNET News.com on Monday. "We had cooperation from the security people from many victimized businesses," he said." Internet | Amazon to Offer Movie Downloads? "Amazon.com is negotiating with three major movie studios about offering digital downloads of films and TV programs, according to reports Friday. Both The New York Times and The Wall Street Journal cited unidentified sources who claimed the Seattle-based e-tailer is in talks with Paramount Pictures, Universal Studios, and Warner Brothers about debuting a service that will sell downloads of movies that can be saved on a PC or burned on a DVD." Gaming | Nintendo Lite Priced under 200 USD. 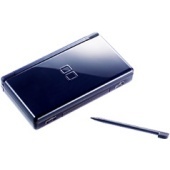 Well, it's still priced less than a PSP, but then again, you can't compare an NDS to a PSP! According to our contacts on the ground, some of Japan's largest retailers (such as Yodobashi and BIC Camera) were unable to maintain reservation lists for their customers for the first time ever. The now officially confirmed number of units shipping is even lower than what was reported earlier by various industry sources, especially considering that the Nintendo DS is constantly sold out in Japan since shortly after Christmas, with Nintendo being unable to produce enough units to satisfy the market. Don't bother waiting for your Intelised Mac to be upgraded, when you can do it yourself, according to this article anyway. "There's an upside to Apple's decision to use bog-standard PC chips. Mac owners don't have to wait for the aftermarket to produce custom boards to rev their machines. And they don't have to sit idling in front of roadblocks set up by Apple, either. No sooner had the single core Mac Mini rolled onto the market, then an enterprising hardware hacker has given it a professional upgrade - using standard Intel chips." Here's a video of Microsoft's Project Origami handheld. If the video is genuine, I want one. "Imagery of circuitry, clouds and office buildings has sparked rumors that Microsoft may be readying a new mobile communications device. Company evangelist and blogger Robert Scoble says he was unaware of the Origami Project site, but hints: "I do know that Origami is the code-name for a new kind of device. Oh, heck, here come the NDA police, gotta go!" Scoble's comments may refer to a prototype handheld device demoed at COMDEX in 2001 by National Semiconductor." So with all the hooplah, what exactly is it? Well, judge for yourself or wait until March 2nd. There is a gun (BFG) in the new EA Black game that lets you blow up just about everything. It was given only to people who pre-ordered the game. Looks like someone found the congratulations page on their website. Some light friday reading for you folks.